Quick Parts in microsoft word 2007 lets you reuse/recycle any content in documents including a cover page, headers, footers, tables, watermarks,fields, document properties such as title and author, or any preformatted snippets, and more through building blocks. Building blocks can be created by saving any item within an office 2007 word document, using the Quick Parts tool.These building block can then be reused in any other document to save you time and effort and thereby improving your productivity. 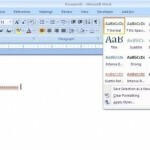 How to save any item in Microsoft office word 2007 document ? How to reuse content using Microsoft word 2007 Quick Parts ? That is all folks . Isn’t quick parts a neat and useful feature in word 2007 ? Go ahead and Use quick parts to jumpstart your productivity. We had earlier covered another useful tip on how to quickly create a word template in microsoft word 2007 and improve your productivity. Use these productivity enhancers in Microsoft word 2007 and enjoy. 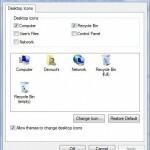 Recycle Bin has disappeared from Desktop in Windows XP – How to make it appear?